Those enjoying a visit to the HREC Rod Shippey Hall for our various functions and trainings may spot these beautiful white flowers peeking out right along the trail to the hall. What you may not realize is that you are in fact walking in the area that this new species was discovered only recently. 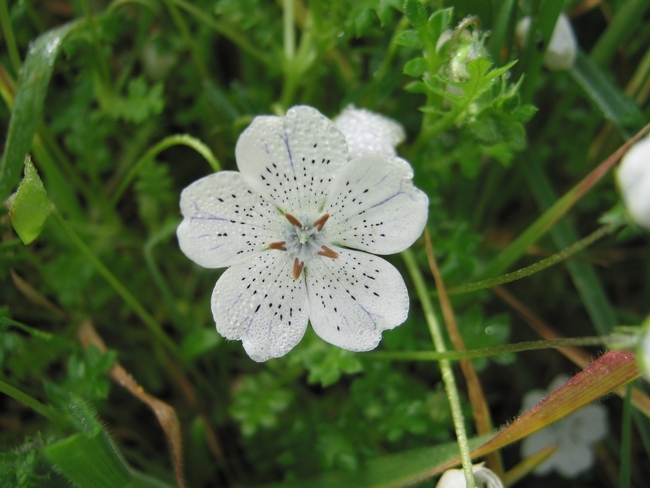 This species of Nemophila growing sympatrically in Mendocino and Napa counties with a closely related species (Baby Blue eyes) was discovered at Hopland Research and Extension Center a few years ago. 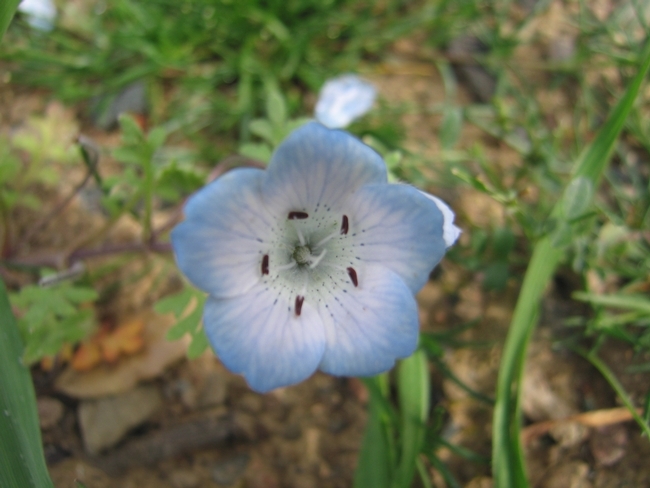 The new species, Nemophila hoplandensis, differs from Nemophila menziesii var. atomaria in both floral and vegetative color. The corollas of N. menziesii var. atomaria range from deep blue to a bluish white. Nemophila hoplandensis has large and unusually bright white corollas and vegetative structures that are a brighter green than those of N. menziesii var. atomaria. Controlled crosses were made in order to ascertain these populations were a new species; despite sharing pollinators N. hoplandensis is reproductively isolated from N. menziesii var. atomaria via failure of hybrid seed production following artificial crosses. Molecular phylogenetic analyses also clearly differentiate N. hoplandensis within the genus. The newly described species, currently known only from Mendocino and Napa counties, has a range that is more restricted than, and lies within the range of, N. menziesii var. atomaria. It's good to hear from the Hopland Station, especially after such a long silence. But what happened to Robert J. Keifer? And, who is Hopland's Director now? I would really appreciate answers to the questions. Charles Raguse, Professor emeritus, Agronomy & Range Science.